Petrochemicals are found in a wide array of household items, from plastic wrap and trash bags to plastic bottles. Because humans rely so heavily on petrochemicals, their production is high, affecting the environment via oil spills on land and sea and fossil fuel combustion emissions. 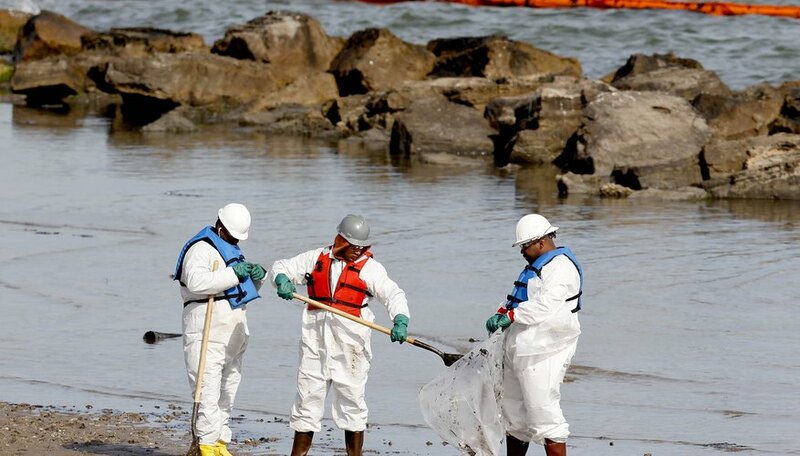 Large oil spills cause widespread damage in the marine environment. Intertidal habitats including rocky coasts, sand flats, mudflats and salt marshes are particularly vulnerable according to the U.K. Marine Special Areas of Conservation website. Oil coats the surface of the water as well as the sediment surfaces and vegetation surfaces, smothering plant life and microbial life, which affects the rest of the food chain. Ocean animals are poisoned and smothered as well. Large spills are lethal to coral reefs as well, according to the National Oceanic and Atmospheric Administration. Petrochemicals are created through the manipulation of fossil fuels. The burning of fossil fuels and petrochemicals has significant negative impact on the environment. When burned, petrochemicals release ash, nitrogen, sulfur and carbon into the atmosphere, contributing to smog and pollution, according to the Environmental Literacy Council. When these chemicals combine with water vapor, they can cause acid rain. According to the United States Environmental Protection Agency, greenhouse gases created by the burning of petrochemicals, which includes carbon dioxide, warm up the Earth by trapping heat in the atmosphere. The effects of climate change and the possible warming of the planet include the rise of sea levels through the melting of ice caps and glaciers, as well as potentially dramatic weather changes. Local ecosystems can be harmed by the extraction, utilization and transportation of petrochemicals, according to the Environmental Literacy Council. By digging for coal and oil, large amounts of salt water are often brought to the surface, causing potentially severe damage to the natural flora and fauna. Extraction can also significantly change the environment itself through digging and exploration. Ruland, Greg. "The Harmful Effects of Petrochemicals on the Environment." Sciencing, https://sciencing.com/harmful-effects-petrochemicals-environment-8771898.html. 25 April 2017.